PT Sigma Cipta Caraka - PT SCC or referred to as "Telkomsigma" is a member of PT Telekomunikasi Indonesia Tbk (Telkom Group), which has been in the information technology company (ICT) business since 1987. PT Sigma Cipta Caraka started operations in 1987 as an IBM chosen partner and started its business by selling hardware to local banks in Indonesia, and within 29 years has established itself as the leading ICT company in Indonesia as its controls about 34% of managed services market. Telkomsigma has strong business focus in the integrated end to end ICT services. Its business include system integration, data center, cloud computing, and managed services. PT Sigma Cipta Caraka is a directly-owned subsidiary company of PT Multimedia Nusantara (TelkomMetra), a Strategic Investment Company fully-owned by Telkom Group. 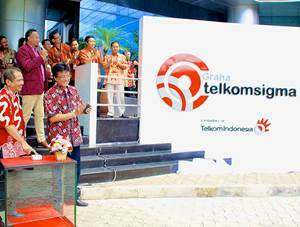 Today, Telkomsigma have a workforce of over 1,300 people spread in Jakarta, Serpong Tangerang, Sentul Bogor, Surabaya and Bali. The Company also supported 4 subsidiaries; PT Sigma Solusi Integrasi, PT Signet Pratama, PT Sigma Metrasys Solutions, and PT Graha Telkomsigma. In term of financial performance, PT Sigma Cipta Caraka managed to strengthen its financial performance in 2014. According to Telkom Group - Consolidated Financial Statements (Audited) FY 2014, Telkomsigma registered a 33.06% growth in total assets of Rp 2,515 billion as compared with Rp 1,890 billion in 2013. Background in Bachelor's Degree (S1) in Computer Science / Management, Information Technology, Information Sytem. Minimum 4 years of experience on enterprise business application design, development and architecture. Have a good knowledge of SQL, Relational database and Data Modeling. Stronng communication and presentation skills. Able to work independently to meet goals and objectives with minimum supervision. JobsCDC.com now available on android device. Download now on Google Play here. Please be aware of recruitment fraud. The entire stage of this selection process is free of charge. PT Sigma Cipta Caraka - Solution Architect Telkomsigma Telkom Group June 2016 will never ask for fees or upfront payments for any purposes during the recruitment process such as transportation and accommodation.